In a medium microwave safe bowl combine water, vinegar, and Splenda; microwave on high for 2 minutes until boiling. Stir in the onion and let it sit for 15 minutes. Drain. Stir in 2 tbsp red onions. Spoon the egg mixture in each egg half and garnish with the remaining onions and chives. This entry was posted in Metabolic Medical Center Recipes, Modified Profast (Fast and Flexible) Recipes, Uncategorized, Vegetables and tagged Boiled egg, deviled eggs, eggs, fat-free mayonnaise, mustard, onions, pickled onion by foodies4mmc. Bookmark the permalink. 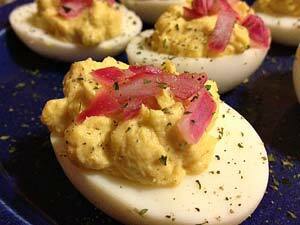 Pingback: Deviled Eggs | A Caffeinated Brunette | Hey Sweetheart, Get Me Rewrite!